Ukrainians love their Borscht. Actually most Eastern Europeans love all kinds of soups, and very often a hearty soup, with a piece of fresh rye bread, makes a full meal. Meat is not consumed in large quantities in Europe, as it is in the US, but soup is always the first course served with lunch, or dinner. This quick and easy version of preparing a Ukrainian Red Beet Borscht, was shared by my cousin from Ukraine. It is quick easy, because most of the ingredients are already prepared, and do not require much prep time as for the Ukrainian Traditional Borscht, I posted previously. My family agrees that this Borscht can easily be the main course, since the beans provide sufficient protein, as a substitute for meat, plus all the other veggies in this borscht. Add some tossed salad, plus a light dessert, and everyone will leave the table quite satisfied. 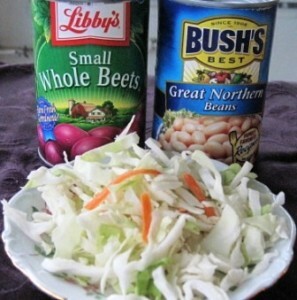 Three main ingredients, all ready to use; Whole Red Beets, White Beans, and pre-cut Coleslaw cabbage. Drain the Whole Red Beets, rinse, and shred on a large eye shredder, or in a food processor. Peel one medium size potato, and cut to small cubes (size of a dice). Pour 2 1/2 quarts of vegetable, chicken, or beef broth into a 4 quarts pot, and bring to boil. Add the potatoes, and cabbage mix. Bring to boil, and cook for 15 minutes. Saute chopped onion and garlic, in butter, until onions are translucent. Add the shredded beets, beans, and sauteed onions, to the borscht. Add vinegar, and cook for 10 minutes. Scoop sour cream, or heavy cream into a cup, mix in a couple of Tbs of hot borscht liquid, to temper the cream, add some more hot liquid, and mix well again. Add the sour cream mixture to the borscht. Do not boil, if using sour cream, to prevent curdling. Great as a reheated leftover. To make this recipe vegetarian style, use Vegetable Broth as the base, rather than Chicken or Beef Broth. I am not sure how many cups (1 1/2 – 2), but the cans are 425 grams, each. Thank you for visiting again. Good luck with the borscht. My husband really loves it. Since it has all these veggies, it is quite filling. I will continue sharing my recipes, as long as there are enough interested people reading them. I will keep them coming…. In this particular recipe, I like to add the sour cream into the borscht while still in the pot, to flavor it, but to not boil it. Same applies to reheating. It will be fine to reheat it, as long as you do not bring it to boil. When I make the Traditional Ukrainian Borscht, like for Christmas Eve, I do not add the sour cream to the borscht, but do serve it on the side, since some people like to add it into their bowl of borscht before eating. Did your family like this borscht? My husband and my daughter liked it a lot. The beans add some bulk to it, almost making it a full meal in itself. 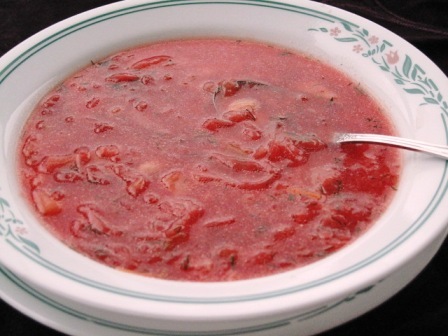 Thank you so much for stopping by my blog and sharing your borscht tips. Next time I will have to try the sauerkraut, instead of the vinegar, to taste your style Ukrainian Borscht. Your comments are welcome any time. You are welcome. My husband like all his soups hot, so always make them that way….but on a hot summer day cold borscht hits the spot for me.